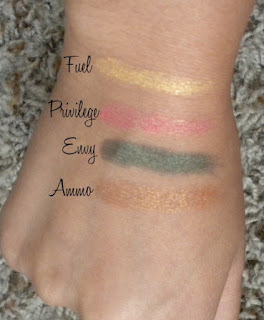 Because I have an extreme addiction to Youtube and I am a big fan of Hautelook, I have found myself being very intrigued in ordering Rock & Republic eyeshadows. I saw a lot of beauty gurus talk about the shadows and how much they like the brand so I decided try the brand whenever I saw it on sale. When I first saw the brand go on sale on Hautelook, I immediately bought. I have made two orders from Hautelook in order to build up my eye shadow collection, and have collected 4 eye shadows from R&R. I have to say I love them. I am not a huge MAC eye shadow collector. (I only have two of them, Shale and Woodwinked.) With that being said I do think MAC eye shadows are awesome from the ones that I have, but I feel R&R shadows are just as good. You all know I’m a fan of packaging and I love R&R’s packaging and logo. It looks so sheik and it also comes with a decent sized mirror. But besides the really cute packaging it comes with more product than MAC eyeshadows, which give you more bang for your buck if you’re shopping for them on Hautelook. The product itself is extremely pigmented and the colors that I do have go on the eyelid smoothly. They last on me all day with a good eyeshadow primer, so I have no complaints! Two thumbs up for R&R! If you have not signed up for Hautelook, I highly encourage you to do so! If you are a big makeup lover like myself they have many great deals for you to take advantage of. Brands like Urban Decay, Stila and of course Rock and Republic go on sale for such amazing prices. Do you have a Hautelook account? Would you try R&R eye shadows? I'm also addicted to you tube,lol!! I did't know that brand,sounds interesting!! I now follow you! !Hope you follow back!! Keep up the great work,girl<3. btw I love your blog and I am now following! Thank you so much for the feedback!